Think truffles are all fancy and complicated? Well, I’m here to prove otherwise. All you need is a bag of Oreos and a block of cream cheese. Oh, you’ll need a food processor, too. 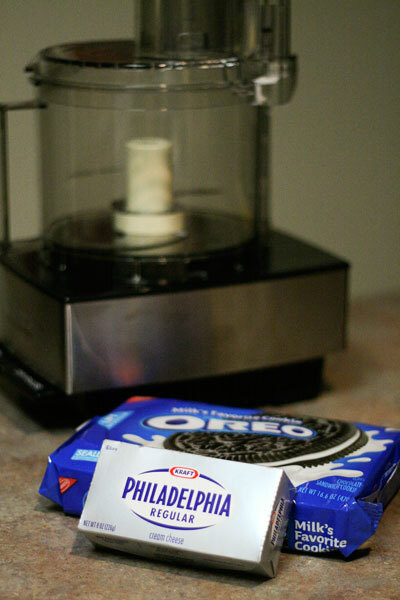 Add the Oreos and room temperature cream cheese to the food processor, and pulse until the mixture is sticky and shiny. It should take 2-3 minutes. Cover the Oreo dough and put it in the refrigerator for at least one hour. Then roll the dough into ~1-inch balls, and place them on a sheet pan covered with parchment paper. While they may be perfectly tasty at this point. Resist the temptation. They’re only going to get better. Melt semi-sweet chocolate chips (and a bit of shortening to thin it out, if necessary) over a double boiler. Stir constantly until smooth. 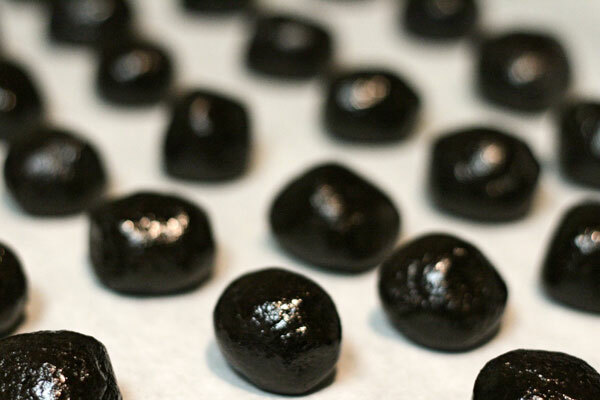 Then coat each Oreo ball completely. I’m sure there’s a more efficient way to coat the balls, but I don’t mind the two-spoon-method. 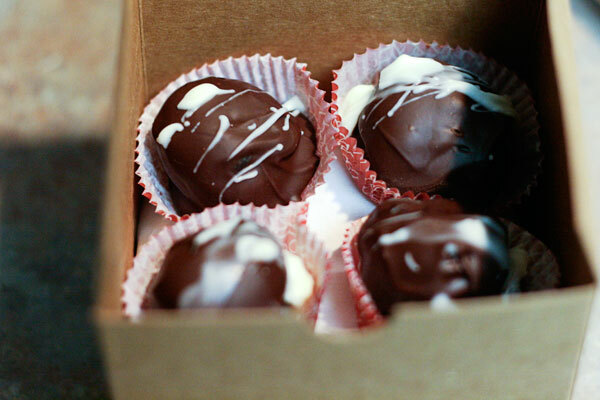 You could also coat the balls in white chocolate, though I prefer to drizzle just a bit on top. 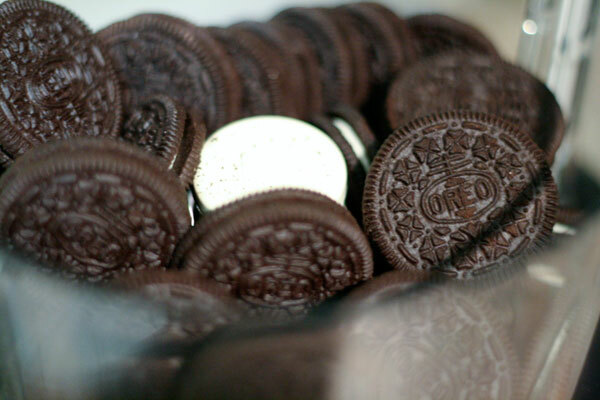 You could even add some food coloring to the white chocolate — red and green, perhaps? Put them back into the refrigerator for at least another hour before serving. And there you have it. 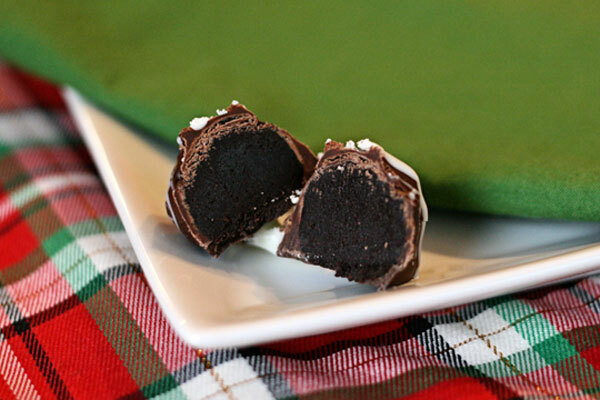 Easy Oreo truffles! Just look at this decadent treat. We boxed up a few truffles, along with some pumpkin oatmeal cookies, and distributed them to Nick’s colleagues on Friday night. I suspect they were a hit. And I plan to make at least two more batches next week for our family Christmas parties. I think I’m also going to attempt a peanut butter variety, too: Nutter Butters plus cream cheese. Sounds good, right? 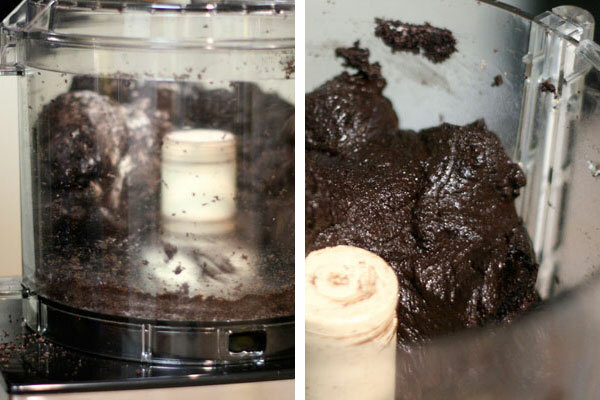 Add Oreos and cream cheese to food processor. Pulse 2-3 minutes until sticky and shiny. Refrigerate for 1 hour to harden. 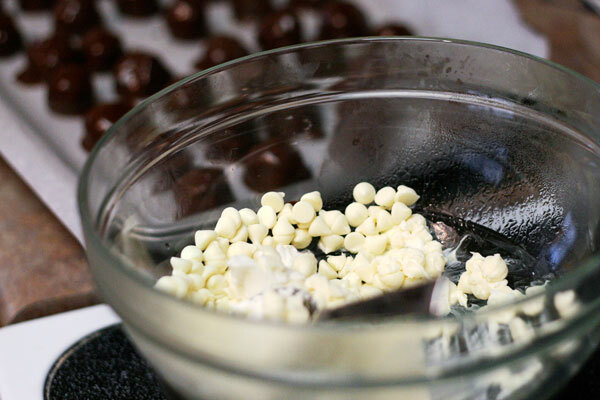 Melt chocolate chips over double boiler, stirring constantly until smooth. 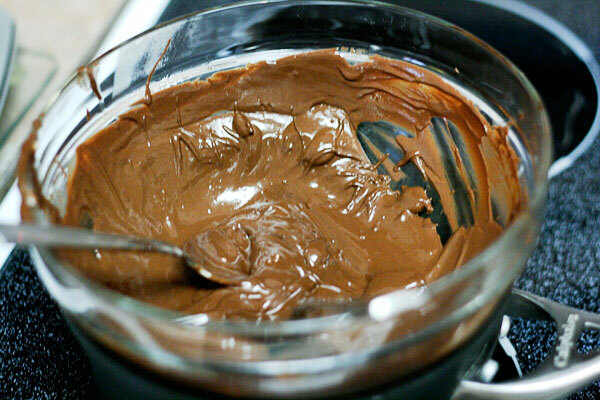 Add vegetable shortening if chocolate is too thick (2 Tbsp of shortening / 12 oz of chips). Edited: Thanks to sister Kirsten for first sharing this recipe way back in 2007! And another festive idea from Nina: Sprinkle crushed candy canes on top! Oh, wow… your desserts always make me excited to try a new recipe. 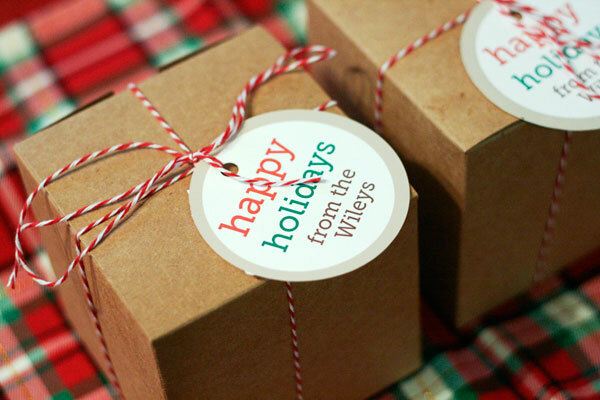 These look so good – and perfect for gifts for colleagues! Yum! Reminds me of the cake balls we just made! We should have an “all balls” supper club in the future. I will definitely be making these! I will have to do so at my parents’ because I don’t have a food processor (at the top of my shower gifts wishlist!). We got our food processor with wedding gift money, and we love it! 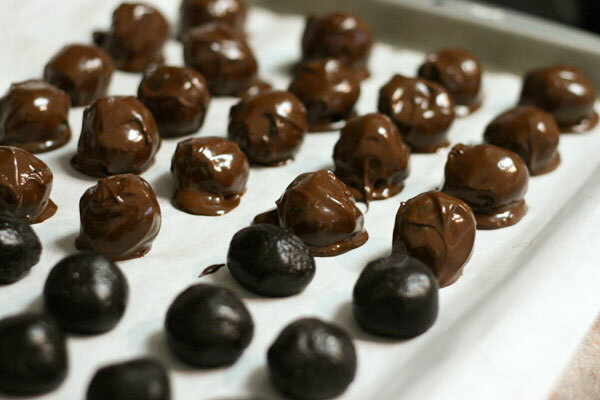 Virtual truffles to all of our wonderful blog friends! Hey, you bringing any of those to the holiday party next week??? Edited to add a shout-out to you, girl! Just wanted to say I love your blog. What a wonderful team! You should write a cookbook for couples, and include lots of relationship advice too! I’d love to give something like that as a wedding gift! Great work. Thanks for the info and entertainment! Alison, we are blushing! Thanks for the very sweet comment. Maybe some day we will pursue that book idea. Cooking and writing are two of our favorite things, after all! You two are so cute! I love that you gave these as gifts and is that twine from The Twinery I see you used!? I love giving tasty treats as gifts. You must post an addendum to this when you try the recipe with Nutter Butters! The twine is from Divine Twine. We have a whole spool of it for our Christmas gifts! And, yes, we’ll definitely post a follow-up with the Nutter Butters outcome. If I send you my mailing address, can you mail me these?!?! Just kidding…unless you will. My grandma makes these for christmas every year, and every year I make myself sick after eating the whole batch. 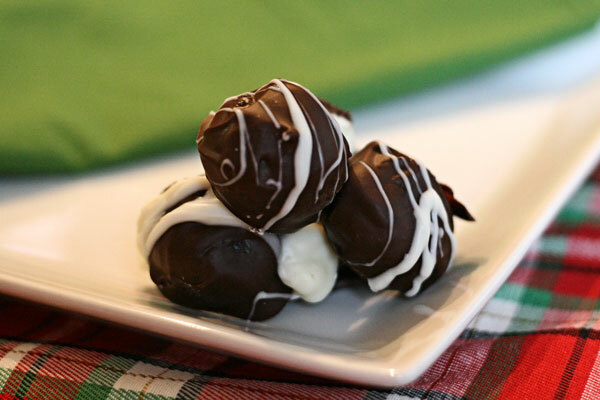 I like the idea with the white chocolate and / or candy canes on top… will have to try! I made these today! They were a big hit! !